Nozawa Onsen accommodation is mostly in the style of a traditional Japanese Ryokan, although there are some hotels offering western style accommodation. A ryokan is a type of traditional Japanese inn that originated in the Edo period (1603–1868), when such inns served travellers along Japan’s highways. They typically feature tatami-matted rooms, communal baths, and other public areas where visitors may wear yukata and talk with the owner. 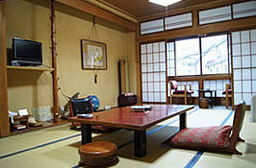 If you are looking for a genuine cultural experience in Japan, then staying in a Ryokan in Nozawa Onsen is a great idea. Accommodation available from $86pp / night. Select from our best picks of Nozawa Onsen accommodation on the left, or call us on 02 9810 1000 for a customised quote.